Noah Wealth Management, an arm of US-listed, Shanghai-based Noah Holdings Ltd, has obtained a licence in the UK Crown Dependency island of Jersey to offer trusts to its wealthy Chinese clients, in association with Jersey-based JTC, the corporate services provider. According to JTC, it has now become the first company ever to set up a managed trust company in Jersey for a mainland Chinese institution. The licence was issued by the Jersey Financial Services Commission last month to Ark Trust (Jersey) Ltd, a Noah subsidiary established in Jersey earlier this year. An event to formally mark the deal took place earlier this week, attended by executives from both companies and An Kelles of Jersey Finance (see photograph). 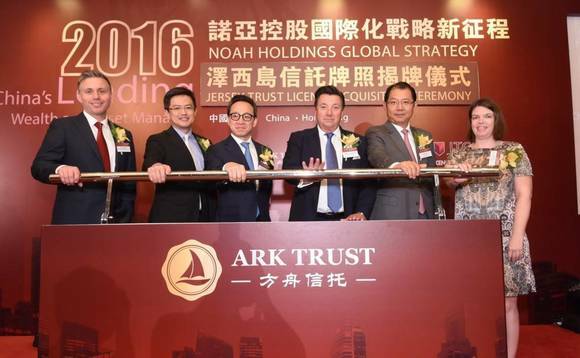 Under the licence, Noah Holdings will now be able to offer Jersey trust structuring solutions to its client base (of 105,557, as of March 31, according to its website), with JTC providing ongoing administration services for Ark and any trusts for which it acts as trustee, JTC said in a statement. Founded in 2005, Noah specialises in providing global wealth management services to high-net-worth individuals and enterprises in China. When it listed on the New York Stock Exchange in 2010, it became the first-ever mainland Chinese wealth manager to do so. It said it distributed the equivalent of US$3.8bn in wealth management products and investments in the first quarter of this year, via a network of some 1,137 relationship managers across 166 branches and sub-branches in 68 cities in China. A wholly-owned subsidiary in Hong Kong looks after the international investment needs of its clients. In 2014, it launched a proprietary internet finance platform. Jersey-based JTC says it’s well-positioned to support Noah’s Asia-based business due to its “well-established links” with Hong Kong and mainland China, and more widely through a strategic alliance with JTC Kensington, which has offices and a prominent presence in Singapore, Hong Kong, Indonesia, Labuan, Malaysia and New Zealand. Left to right in the photograph, above: Iain Johns, of JTC; Zhe Yin, chairman and CEO of Gopher Asset Management, a Noah division; Kenny Lam, group president, Noah; Nigel Le Quesne, JTD; Yihao Liu, CEO, Noah Hong Kong; and An Kelles, business development director, Jersey Finance.